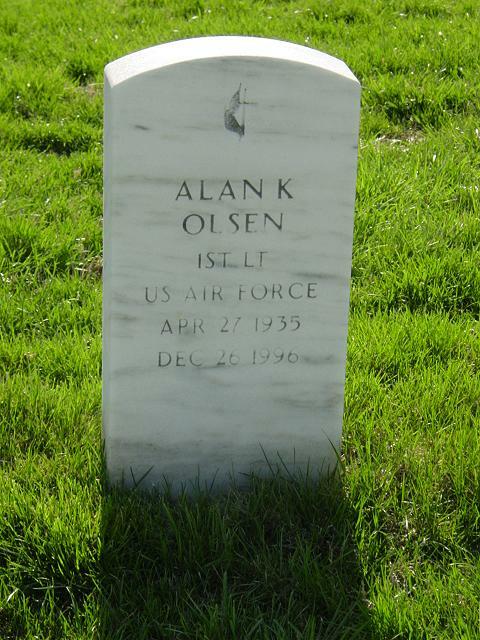 Alan K. Olsen, 61, director of the Air Force base conversion agency, died of stomach cancer December 26, 1996 at his home in Springfield, Virginia. Mr. Olsen was born in Fargo, North Dakota. He graduated from North Dakota State University, where he also received a master's degree in mechanical engineering. He received a second master's degree, in public administration, from Harvard University. From 1958 to 1961, he served in the Air Force. On his discharge, he became a civilian engineer at Kelly Air Force Base in San Antonio. He was chief of the engineering and reliability unit there when he was reassigned to Washington in 1980 as associate director of maintenance and supply in the office of the deputy chief of staff. In 1993, he was named director of the Air Force base conversion agency, which plans the disposition of Air Force bases earmarked for closing. Mr. Olsen was a woodcarver and a member of St. Stephen's United Methodist Church in Burke. Survivors include his wife, Marilyn C. Olsen of Springfield; two sons, Timothy J. Olsen of Sterling and David A. Olsen of Winchester, Va.; two brothers, James Olsen of Huntington Beach, Calif., and Kent Olsen of Albert Lea, Minn.; and three grandchildren. NOTE: He was granted a waiver for burial in Arlington National Cemetery.